If you are like me, you like to plan ahead. And so here is a great St. Patrick’s day breakfast, a full 51 weeks ahead of time! You’re welcome. When these came out of the oven, I worried because I had ten minutes to spare before the kids got up for breakfast. Would they be stale before anyone woke up? But this recipe is from Smitten Kitchen and she American-ized it with an egg and I’m not sure what else, but they lasted long enough to be eaten for breakfast and snack. So they were delicious enough to be gobbled up, and they didn’t become immediately stale. High praise for soda bread. I followed this recipe and I left out the caraway seeds because I’m not a monster. I served these with a fried (Luke) or a scrambled (Jack) egg. These may be my new St. Patrick’s Day breakfast. I will remind you a week in advance next year. Sláinte! This entry was posted in food and tagged breakfast, scones, soda bread on March 24, 2017 by metamegan. Last Friday I officially made a Fancy Breakfast Friday without a plan. I just got up in the morning and made something fancy. The menu was Bacon, Scones with Jam, and a Watermelon Smoothie. The scones were easy because they called for melted butter instead of using a pastry tool to cut in cold bits of butter. 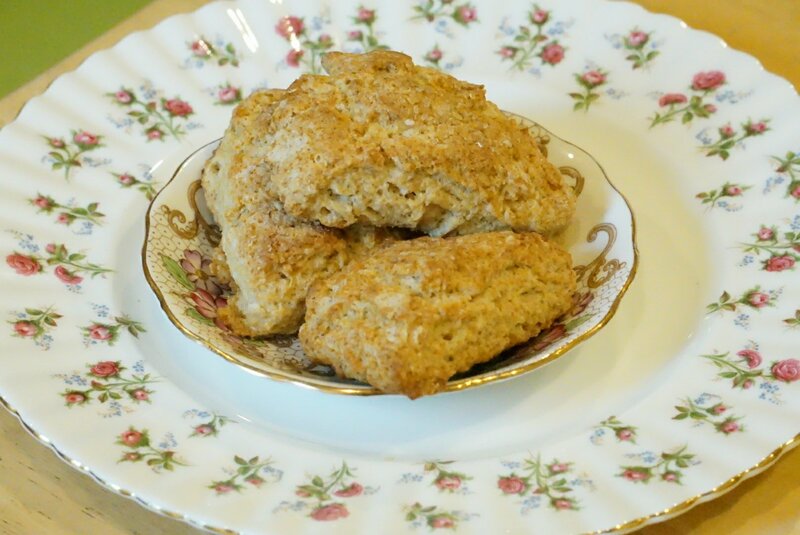 When I was reading the recipe I was thinking it was heavier on the fat and lighter on the sugar that then my usual scone recipe from cooking light. And I was thinking about how extra sugar can be a way to improve flavor in “low fat” recipes, blah blah etc. I was proud of myself for embracing butter. But in the end… it wasn’t sweet enough for me. The boys loved these scones though. And they were very easy to make… So I will probably keep them in the repertoire. These are from Mad Hungry, as is the recipe for cooking bacon in the oven, which I love to do. Of course the recipe is also available online, but if you are a cookbook person, I think this is a good one. The Mad Hungry Coffee Cake recipe has also made a debut here on FBF. The Watermelon Smoothie was just a burst of genius I had about how to make the breakfast more filling, colorful, full of lycopene, and also… to make room in the fridge by using up the watermelon. I have mixed feelings about smoothies. On the one hand, they seem to be a way to incorporate more fruits and veggies into breakfast. On the other hand, why not just chew your food? Regardless, these were very delicious and refreshing. I made them to order as the boys woke up. Dave declined a smoothie. Add everything to the blender and mix until smooth. Do you see the big fat novel in the background? There should be a book club post coming Monday. *Links to books are affiliate links. 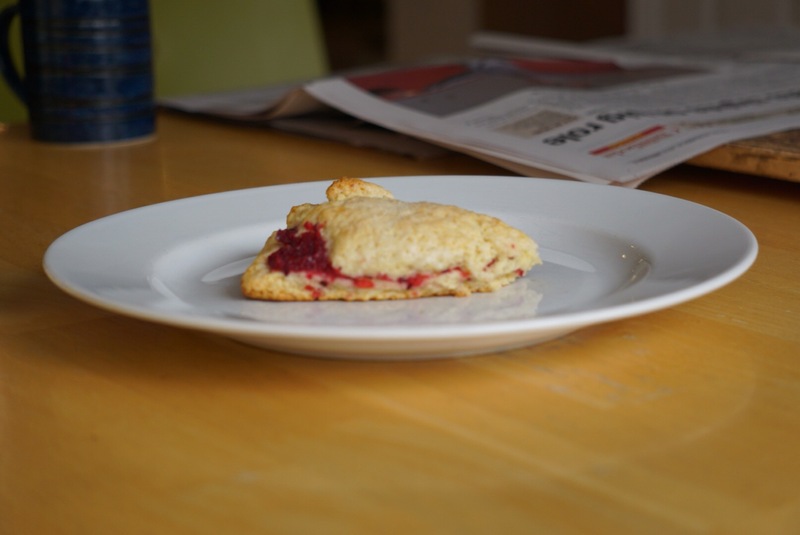 This entry was posted in food and tagged breakfast, scones, smoothie on July 8, 2016 by metamegan.